I first made my mark in EVE Online by publishing the tears of botters I found on their forums. Amazingly enough, people like reading about bad things happening to botters. But as the years went by and CCP became more adept at banning bot users, the bot developers started restricting and deleting posts that made their code look less than appealing. I still posted tears, but only on Twitter, not on the blog. I do like RMT tears, though. I looked in my screenshot folder where I keep all the tears I collect from Player Auctions and I think I have enough to do a long-overdue post. Player Auctions is a site where people go to buy ISK, gold, plat, gil, and lots of other virtual currency and items found in online video games. The satisfaction ratings are a bit inflated and don't reflect how often sellers and buyers get caught by CCP. Keep reading to see the entries I captured before the sellers could bribe upset buyers into changing their reviews. Ever since getting back home after Fanfest, real life has kept me busy. I finally got to spend a little time last night doing some research on where to find mining mission agent hubs in New Eden. I define mining mission agent hubs as systems containing 3 or more agents of a certain level. Ideally, the agents would all belong to the same corporation in order to build up loyalty points. Why disperse your efforts when trying to get those sweet, sweet implants that give a 5% bonus to mining or ice harvesting yield, right? A funny thing happened during my search. I noticed a few anomalies. For example, why is Aldilur, a system in Metropolis 3 jumps from both a rookie system and a career agent system, a super hub? The Minmatar Mining Corporation has 3 level 1, 4 level 2, 6 level 3, and 5 level 4 mining agents in the system. Sure, the system has a 0.9 security rating which means the payout is much less than in other trade hubs, but a dedicated miner never has to leave the system except to go to Rens to sell loyalty store items and perhaps veldspar. The corporations from the Gallente Federation are more spread out, with five systems containing three or more level 4 mining agents. Curiously, one of those systems is Ingunn, in the Minmatar region of Heimatar. A product of the Minmatar Mining Corporation's effective monopoly? Perhaps even more curious is Astral Mining Inc.'s presence in Annancale. The Gallente mining corp has 9 level 4 and 4 level 3 agents in the low sec system only two jumps from Intaki. In the Caldari State, all of the level 3 and 4 mining mission hubs are located in high sec. Is that a product of corporate caution? Or were Poksu Mineral Group and Caldari Steel able to sway the Caldari government into providing additional security for their operations? On the flip side, the two level 3 and 4 Amarr mining mission hub systems of Mamet and Ziriert are both located in 0.1 security systems located 2 jumps from Providence. If the two adjacent systems are treated as one, the hub has a total of 15 level 4 and 8 level 3 agents. The question I had when first looking at the hub is, why did Imperial Armaments and Zoar and Sons split the area. Imperial Armaments has 7 level 4 and 4 level 3 agents while Zoar and Sons has 8 level 4 and 4 level 3 agents in the area. I know, I know. I'm just supposed to mine and obtain loyalty points. The agents were probably distributed via a random draw. Still, inquiring minds want to know why the cluster is laid out this way. Perhaps the saltiest of the defeated candidates in the 12th Council of Stellar Management election is Sullen Decimus. Sullen is an incumbent from CSM 11 who would have not won a seat on the council if CCP had reduced the size of the CSM from 14 seats down to 10 last year. Needless to say, his not winning this year came as no surprise. However, Sullen claims the reason he lost was not lack of support, but due to the single transferrable vote system used in CSM elections. He maintains that CSM should use a different system, the weighted vote. In a weighted vote system, players would cast their votes for ten candidates, with each vote receiving a value depending on the position of the vote. For example, the candidate at the top of a voter's ballot would receive 10 points, the second candidate 9 points, and so on down the line with the candidate at the bottom receiving 1 point. Players outside of null security space already claim that the voting system is rigged in favor of the large null sec blocs. Sullen's proposal looks to rig the voting in favor of his coalition, the Imperium. I ran the CSM 11 election using a weighted system, and the results are in the table below. Using a weighted system in the election results in three changes to the makeup of CSM 11. Out are Bobmon (Pandemic Legion), Nash Kadavr (Pandemic Legion), and Fafer (Northern Coalition.). A weighted vote system would have replaced the historical winners with Goonswarm Federation's Chiimera and Wyld along with Annexe from Tactical Narcotics Team. The disparity in favor of the largest null sec alliance/coalition using a weighted vote system vs. the single transferrable vote is even greater than appearances first suggest. In a weighted voting system, the vaunted Goonswarm ballot would have helped elect 9 candidates in the CSM 11 election. In the actual results, only 6 candidates from the Goon ballot won seats. But of those 6 candidates, two candidates, The Judge and Kyle Aparthos, received no trickle down support from the Goon ballot. A third candidate, Xenuria, was so popular that he used less than 50 votes of the trickle down to hit quota. Xenuria actually needed no support from the Goon ballot to win, which is a good thing for Sullen or the candidate from The Bastion would not have won last year either. So, looking back at the CSM 11 election, the system proposed by Sullen Decimus, a member of The Imperium, would have resulted in the official Goonswarm ballot contributing to the victory of 9 members of the Imperium. Using the single transferrable vote system, the official GSF ballot only contributed to 3 Imperium members winning seats. Perhaps to someone sitting in Delve, such a result seems fair. I'm pretty sure the rest of New Eden would disagree. Fanfest is over, but I wanted to write one final post before leaving Reykjavik this afternoon. I attended the CSM Panel on Saturday and heard an explanation for the poor performance of high sec candidates that, upon reflection, was obvious. Basically, the nature of high security space itself makes electing a representative from the security band much harder than the other areas of space. Winning a seat on the Council of Stellar Management in the single-transferable vote era requires organization, preferably a really big organization. Gone are the days when a 1200-1400 member corporation like Eve University could field a candidate with a high degree of confidence of success. As far as I can recall, Eve University stopped fielding official candidates after CSM 7, the last election which used first-past-the-post voting. In general, null sec can support the largest player groups while high sec groups don't get as large. One of the reasons high sec groups don't become as large as null sec alliances is income generation. The design of the game is that null sec generates more income than low sec, which in turn generates more income than high sec. Wormholes are an entirely different kettle of fish that only Bob understands. We are seeing that hierarchy play out today as some of the larger low sec alliances face the decision of either disbanding or moving to null sec in order to generate enough income to survive. Remember, the bigger the group a player belongs to, the better the chance of victory. Perhaps the second major reason limiting the growth of high sec alliances is the war declaration mechanic. When a corp or alliance reaches a certain size, high sec war dec groups begin hitting the growing corp. If the corp consists of mission runners and/or miners, the results are seldom in doubt. The best responses for a high sec carebear corp when facing a war dec is to either 1) leave for low sec, null sec, or w-space, 2) disband the corp and recreate immediately, or 3) not log in for a week. In any of the scenarios, growth either suffers or the corp pulls out of high security space altogether. Can a high sec candidate win? Yes. But winning requires a lot more organizing and diplomatic skill than in null sec. Residents of 0.0 can rightfully say that they already put in the hard organizational work. But null sec alliances create solid organizations to achieve their in-game goals. High sec residents don't need such elaborate organizations to perform their day-to-day activities. Unlike null sec alliances, most high sec groups would require an additional level of organization to successfully compete. The question is, do high sec residents think that the CSM is worth the extra effort. All signs point to no. Today's Friday, which means a jam-packed schedule. However, I should make a couple of comments about the results of the CSM 12 election. First, the issue of relevance will assuredly come up as the players elected a null sec dominated body when CCP is working on an expansion focusing on empire space. We have 8 null sec representatives, 1 wormhole rep (who people here in Reykjavik keep telling me is not really a wormhole rep), and a 3rd party dev/industry candidate who does not fall into any security band. Expect CCP to look outside the CSM quite a bit for advice and feedback. Next, the low turnout of 31,274 was still a 28.6% increase over last year's 22,345. I thought that the low turnout would help Sort Dragon, but Vince Draken's renter-supported campaign won instead. Brave Collective once again displayed electoral muscle by getting Yukiko Kami onto the CSM. When Brave backs a candidate, the candidate wins. On the other end of the spectrum, Pandemic Horde's Kalbuir Skirate lost. At this point, Pandemic Horde's electoral performance reminds me of TEST's. I have to wrap up the post in order to make the first presentation. I'll just close with the thought I can't wait to see the vote files released in order to see exactly what happened. Fanfest officially begins today and in a couple of hours I will attend my first event. As I normally do, I go through the events and make a list of the presentations I plan to attend. 12:00 - 12:30: Kyonoke Inquest SitRep - The first session of the ARG concerning the inquiry of the Kyonoke Plague. I really do need to check it out at least once. Jin'taan produced an introductory video on the story. 17:00 - 18:00: Opening Ceremony - The first presentation of the convention. 18:00 - 19:00: EVE Online Keynote - One of the surprising notes of the convention is the lack of a CCP Keynote presentation. Will we see other products mentioned in the EVE Keynote? The first presentation guaranteed to produce tears as the CSM election results are announced. I also expect some tears to flow from some of the upcoming changes. That reminds me; I need to purchase one of those Lacrimx bottles. 19:00 - 20:00: Kyonoke Inquest Vote - The ARG continues. 10:30 - 11:00: Kyonoke Inquest SitRep - The ARG continues. "A look into methods that differ from the 0.01 ISKing in Jita 4-4 that you might usually associate with trading, and a few obscure mechanics that had the potential to generate a lot of profit before they were patched out or deprecated." 12:00 - 13:00: Game Design Panel - Honestly, I may just skip this block of time and eat lunch. The session is pretty much a Q&A. I usually don't like those. 13:00 - 14:00: Project Discovery - Exoplanets - The next scientific crowdsourcing effort under the Project Discovery label concerns the search for exoplanets. Professor Michel Mayor will give a presentation on the subject. 14:00 - 15:00: The Discourse, Live! - "Join Makoto Priano and the crew of The Discourse will take the stage at Fanfest to give insight into how to produce media for EVE Online." Below is the latest example of their work. 15:00 - 16:00: EVE Graphics & VFX - "Join the VFX Artists from Team Trilambda as we take a look at the major GFX features of the last year, how they were made, plus problems and solutions during development." "With the next generation of Upwell structures arriving this year, now is the time to start talking about what tools Upwell Consortium engineers have in the pipeline for capsuleers." 17:00 - 18:00: Phenomenon Presents - Another must see presentation, as "Team Phenomenon presents the future of PvE through new technology." 18:00 - 19:00: Kyonoke Inquest Vote - The ARG continues. 11:00 - 12:00: New Player Experience - CCP Ghost lays out the future for the New Player Experience. Another must see presentation. 12:00 - 13:00: CSM Panel - How can I not go to this one? 13:00 - 14:00: Lowsec, FW & Crimewatch Roundtable - I usually don't go to roundtables, so I may wind up eating lunch or participating in the ARG. 14:00 - 15:00: Economy Roundtable - Once again, I usually don't go to roundtables, but CCP Quant is running this session. 16:00 - 17:00: The Physics of New Eden - A Max Singularity presentation! "Join Max Singularity as he delves into the physics behind his guest chapter 'Passage of Knowledge' in the new 'Frigates of EVE' book coming this summer!" 17:00 - 18:00: Kyonoke Inquest Vote - The end of the ARG. 18:00 - 19:00: Closing Ceremony. 20:00 - 01:00: Party At The Top Of The World. A short post, as I slept past noon today, putting me back on Chicago time. For those wondering what my RMT research entails, most of my time is gathering raw transaction information from Player Auctions. 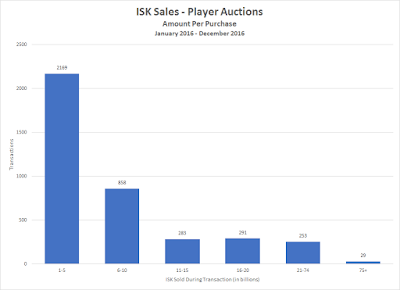 For those interested in numbers, I recorded 4276 transactions involving the sale of either ISK, skill injectors, or PLEX in 2016. So far in first 94 days of 2017, I've recorded 2083. My data is only final through 5 March, however. 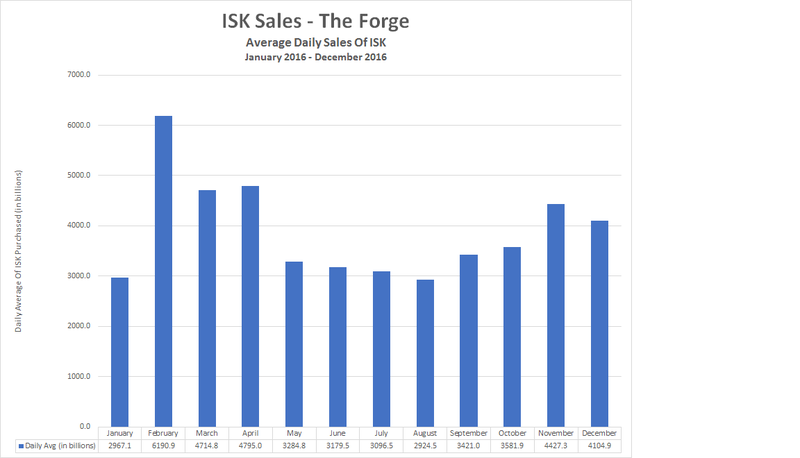 Even so, I think I can state that the introduction of a free-to-play element to EVE Online brought with it a big increase in illicit RMT activity. For those who follow real money trading throughout the gaming industry, the fact that RMT is up after the introduction of F2P is no surprise. I just happen to have some numbers to back up that belief. I am not the only one tracking illicit RMT within the EVE universe, and I talked with a couple of them last night. Some can lay out cases involving market transactions that look dodgy as hell. Others just see incongruities in the market and wonder if the black market is responsible somehow. Basically, I'm talking to people who are a lot smarter than I am but lack the out-of-game component to the transactions I possess. Tracking down information on the illicit RMT trade doesn't involve travelling to exotic locations like Reykjavik to meet face-to-face with like-minded souls in dimly lit bars. Nora's is pretty well lit. Like real world intelligence collection, I do a lot of unglamorous grinding. But sometimes I do get to learn a bit more of what is going on in the world of EVE RMT. After last night I have a better idea of what analysis I need to do and the types of information I can blog about that would help some of these people understand what they are seeing. I also probably need to take a couple hours here while the wind is still howling and dig through the data and follow-up on a lead. 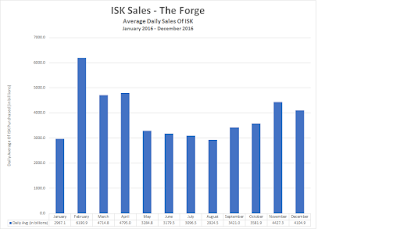 I think a major ISK seller could soon go out of business, if it's not busy closing shop even as I post this piece, and I'd like to know if I'm right about which shop is involved. Today is the day a lot of people will show up for Fanfest, which means the relative peace is about to end. Last night was pretty mellow as I stopped by Nora's for a beer or three. I wound up starting off the drinking session talking to a couple of the regulars about various things, like where to see the Northern lights, what you can and can't say to women about their appearance, and what constitutes doctoring photographs. You know, the important stuff in life. The one gentleman can do some amazing stuff with digital photography with the software on his laptop. I then spent the time talking to a bunch of EVE players who either were in Eve University or had flown with the Uni in the past. Oh, and CCP Logibro was there too. Some people were complaining about things he has no control over, so I decided to complain about things with which he is involved, namely the CSM. Okay, I only complained about the election process and the lack of time before candidates are announced and the start of balloting. Somehow the conversation turned to who I thought had won the election. Since CCP Logibro knows who won, a very interesting experience. Either my analysis was accurate, or I never want to play poker with the man, as he kept a straight face throughout. As usual, the weather had changed while I was in Nora's, with a pretty heavy snow falling. However, I still made my way to Hlolla's for a sub and then trudged uphill to the hotel. I had planned to just do a little RMT research and then get some sleep. Instead, I saw a tweet about the Mind Clash podcast recording, went to watch on Twitch, and then was pulled into Discord and made an appearance. I didn't manage to get to sleep until 4:30. This morning was not too unusual for Reykjavik. After breakfast, I decided to go down to the shoreline and shoot some pictures with my new camera. Two blocks later, the snow started falling pretty heavily. At that point, I turned around to put on some boots and then walk to a store and buy a hat. When I exited the hotel, the snow had stopped. I then walked to 66 North and bought a hat. In the few minutes that activity took, the sun came out. I then walked back to the hotel to pickup my camera and headed to the pedestrian path that runs along the shore. I managed to take some pretty good shots while the sun still shone. Of course, the weather doesn't stay the same for long and I decided to head back to the hotel and write this short blog. By now, some of the people who arrived this morning may have checked into their hotels and possibly even taken a nap. I plan on roaming around bumping into more people. Or maybe I'll just get lunch. In Reykjavik, anything could happen. Sunday was a travel day as I headed to Fanfest. Up until I left for the airport, everything went according to plan except for one little detail. I could not lock my suitcase. The little metal loops had broken and would no longer accommodate a lock. Luckily, I still had an old suitcase that had a broken handle that no longer extends I could use. Hey, one makes do. Getting to the airport was a breeze. As in, what is usually about a 50-60 minute ride only took 35 minutes. Apparently by placing exceedingly high tolls along a 6 mile stretch of road, the state of Illinois made travel to the airport much faster for those willing to pay. I guess no poors allowed. I wanted to time my arrival for approximately when the baggage check-in opened, but instead was the first one on the scene. Not wanting to just stand around, I found a seat and watched as people trickled into the line. I took a couple of pictures and then around 3:30 joined the queue. Did I mention pictures? In addition to my phone camera, I bought a new digital camera that cost more than $35. It cost quite a bit more, but in fairness I did get $115 off. Hopefully I manage to get some good shots. I would have taken some pictures of the plane, but the windows in the waiting area were frosted. Kind of weird, especially as Icelandair has some of their aircraft painted with some nice color-schemes. CCP might want to consider hiring the designer to create some SKINs. I'll admit this year was not as eventful waiting at the gate as previously. Last year, nine people from Tweetfleet showed up on the flight, along with CCP Manifest and Andrew Groen. I didn't know anyone and honestly didn't try to find the spaceship nerds. The closest I came was at the check-in when I talked with the guy at the counter about EVE. He's tried to play a couple of times, but never really gotten into the game. I told him a little about Fanfest and that the biggest flood of nerds would come through on Monday. The flight itself was uneventful. Well, I guess some people might consider 30 minutes of turbulence an event, but I barely noticed. I tried to sleep for once on the flight out to Iceland, but the best I managed was a semi-slumber. Still, that's better than I usually do. My current state is sitting in the lobby of the hotel, waiting until 2pm for check-in to begin. Since I reserved a single room, they can't fit me in. So I went over and ate breakfast at the Laundromat Cafe before writing this post. I guess I should add one last thing. I always enjoy travelling to Europe because Kit Kats are made by Nestle, not Hershey. Yes, the chocolate is better, plus the variations are much greater than in the States. I just tried the Chunky Cookie Dough and I highly recommend it.